Our children had a wonderful time doing the project and learned timely lessons on community service and environmental recycling. It was a school-wide team day project, where kids gathered in multi-age teams to complete the task of decorating two bags each for Earth Day. We’ll be using your site to do follow-up activities such as reading and interpreting charts, reinforcing map skills and math calculations. The messages were written in both Spanish and English, since we are a Spanish Immersion school. Our program went off without a hitch and was received very well by the administration . The City of Woburn’s 2nd grade classes in our 9 elementary schools participated. The Albertson’s store manger was enthusiastic and welcomed us! He then let the children go to the produce area and pick out one piece of fruit to eat on our trip back to school. The children so enjoy doing this and our Eagles store says the customers love them. 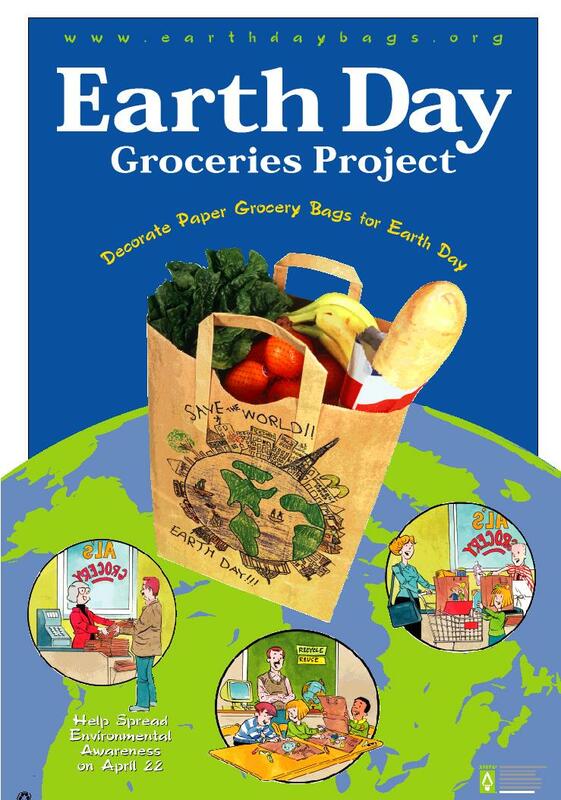 We also decorated a large banner to hang in our Shop-n-Save grocery store that promoted the Earth Day Groceries Project. The manger and staff of Stratford Market were very supportive... They will be passing out the decorated bags to their customers and announcing over the PA system the purpose of our project. Our local newspaper came and took a picture for the newspaper The Daily Journal. We also displayed our project at the "Showcase of Kankakee Schools" at a nearby mall. Students will deliver the bags this Friday and our local newspaper, The Hattiesburg American will be there to take pictures. We had a great time decorating 875 bags for our local HEB. We then took several of the bags out to our local mall and made an exhibit promoting community awareness. Our efforts were written about in the local newspapers and carried on 3 local TV stations. The third graders were even proclaimed "Home Town Heroes." We are displaying 6 new bags daily in our school display case with the heading "Educating the Community." We are also including pictures showing the students’ work in progress. A local environmental magazine picked up the story and published it for Earth Week...Our home page will feature many of the beautiful designs our students created. We worked with our local Kroger store. The children took a field trip to the store to deliver the grocery bags in person. Our students will sack groceries in these decorated bags during the week of April 22. On the trip to deliver the bags back to the grocery store, we cleaned the neighborhood sidewalks and boulevards. We also had a friendly judging competition of the bags. We challenge other schools in the South Shore School Board to join us in showing our community how to reduce, reuse, and recycle.